Fully furnished and remodeled one bedroom Ocean View located in Discovery Bay. 1778 Ala Moana Blvd. 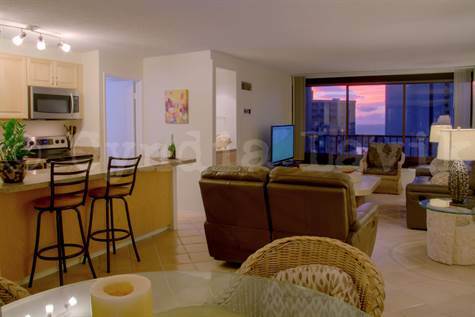 Discovery Bay is located across the street from the Beach and one block to Ala Moana Shopping center and Beach Park. Priced at a 6 month lease or longer. Remodeled, rent includes Internet, all utilities except electric. (Tenant pays electric). 1 covered parking stall included. (Additional parking can be rented from parking garage.) Central Air Conditioning. This unit has a enclosed lanai with windows that fully open across the room. In the commercial area of the building which is separate from the residential portion, there are sundry shops, Hawaiian coffee, Indian restaurant and Hot Wings Restaurant, Sushi, Subway and McDonalds.